circa 753 BC First Settlement in the Iron Age; See Also founding of Rome. 600–524 BC Etruscans control Italy. 550–500 BC Carthaginian occupation of parts of Sardinia and Sicily. 510–27 BC Roman Republic and beginning of Rome's Expansion. 390 BC The Gallic invasion of Rome. 275 BC Etruria becomes part of Rome. 197 BC Iberia becomes a Roman province. 197 BC Athens becomes a Roman province. 146 BC Carthage becomes a Roman province. 129 BC Asia Minor becomes a Roman province. 55, 54 BC Julius Caesar unsuccessfully invades Britannia. 44 BC Julius Caesar is murdered. 30 BC Egypt becomes a Roman province. 27 BC The institution of the Roman Empire begins with Emperor Augustus. 44 AD Britannia becomes a Roman province. Metals and metal working had been known to the people of modern Italy since the Bronze Age. By 53 BCE, Rome had already expanded to control an immense expanse of the Mediterranean. This included nine provinces radiating from Italy to its islands, Spain, Macedonia, Africa, Asia Minor, Syria and Greece, and by the end of the Emperor Trajan's reign, the Roman Empire had grown further to encompass parts of Britain, Egypt, all of modern Germany west of the Rhine, Dacia, Noricum, Judea, Armenia, Illyria and Thrace (Shepard 1993). As the empire grew, so did its need for metals. Central Italy itself was not rich in metal ores, leading to necessary trade networks in order to meet the demand for metal from the Republic. Early Italians had some access to metals in the northern regions of the peninsula in Tuscany and Cisalpine Gaul, as well as the islands Elba and Sardinia. With the conquest of Etruria in 275 BC and the subsequent acquisitions due to the Punic Wars, Rome had the ability to stretch further into Transalpine Gaul and Iberia, both areas rich in minerals. At the height of the Roman Empire, Rome exploited mineral resources from Tingitana in north western Africa to Egypt, Arabia to North Armenia, Galatia to Germania, and Britannia to Iberia, encompassing all of the Mediterranean coast. Britannia, Iberia, Dacia, and Noricum were of special significance, as they were very rich in deposits and became major sites of resource exploitation (Shepard, 1993). There is evidence that after the middle years of the Empire there was a sudden and steep decline in mineral extraction. This was mirrored in other trades and industries. One of the most important Roman sources of information is the Naturalis Historia of Pliny the Elder who died in the eruption of Mount Vesuvius in 79 AD. Several books (XXXIII–XXXVII) of his encyclopedia cover metals and metal ores, their occurrence, importance and development. Many of the first metal artifacts that archaeologists have identified have been tools or weapons, as well as objects used as ornaments such as jewellery. These early metal objects were made of the softer metals; copper, gold, and lead in particular, as the metals either as native metal or by thermal extraction from minerals, and softened by minimal heat (Craddock, 1995). While technology did advance to the point of creating surprisingly pure copper, most ancient metals are in fact alloys, the most important being bronze, an alloy of copper and tin. Alloys are mixtures of different metals created either by smelting or by forging. It is important to note that an ore does not necessarily constitute an alloy; ore is a collection of minerals and alloyed metals. As metallurgical technology developed (hammering, melting, smelting, roasting, cupellation, moulding, smithing, etc. ), more metals were intentionally included in the metallurgical repertoire. By the height of the Roman Empire, metals in use included: Gold, Silver, Copper, Tin, Lead, Zinc, Iron, Mercury, Arsenic, Antimony (Healy 1978). As in the Bronze Age, metals were used based on many physical properties: aesthetics, hardness, colour, taste/smell (for cooking wares), timbre (instruments), aversion to corrosion, weight, and countless other factors. Many alloys were also possible, and were intentionally made in order to change the properties of the metal e.g. the alloy of predominately tin with lead would harden the soft tin, to create pewter, which would prove its utility as cooking and tableware. Copper Iberia, Gaul, Cisthene, Cyprus, Carmania, Arabia, Aleppo, Sinai, Meroe, Masaesyi, India, Britannia. 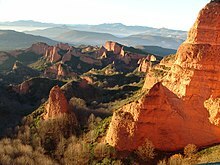 Iberia or modern Spain and Portugal, was one of if not the richest Roman province in the case of mineral ore from around the first century BC (Healy 1978). Containing deposits of the metals (Gold, Silver, Copper, Tin, Lead, Iron, and Mercury), it was very rich in resources. The Romans realised this, and there is evidence of large-scale mining and processing in the region. From its acquisition during the Punic Wars to the Fall of Rome, Iberia continued to produce a significant amount of Roman metals (Healy 1978, Shepard 1993). Similarly, Britannia was also very rich in metals. Gold was mined at Dolaucothi in Wales, copper and tin in Cornwall, and lead in the Pennines, Mendip Hills and Wales. Significant studies have been made on the iron production of Roman Britain; iron use in Europe was intensified by the Romans, and was part of the exchange of ideas between the cultures through Roman occupation (Aitchison, 1960). It was the importance placed on iron by the Romans throughout the Empire which completed the shift from the few cultures still using primarily bronze into the Iron Age. Noricum is the ancient site of modern Austria. Exceedingly rich in gold and iron ore, Pliny, Strabo, and Ovid all lauded its bountiful deposits. Iron was its main commodity, but alluvial gold was also prospected. The province itself had been assimilated into the Empire through prolonged peaceful contact from 181 BC when the Romans colonised Aquileia, a major trading centre between the two nations. By 15 BC, Noricum was officially made a province of the Empire, and the metal trade saw prosperity well into the fifth century AD (Shepard 1993, Healy 1978). Some scholars believe that the art of iron forging was not necessarily created, but well developed in this area and it was the population of Noricum which reminded Romans of the usefulness of iron (Aitchison, 1960). For example, of the three forms of iron (wrought iron, steel, and soft), the forms which were exported were of the wrought iron (containing a small percentage of uniformly distributed slag material) and steel (carbonised iron) categories, as pure iron is too soft to function like wrought or steel iron (Sim 1999, Aitchison 1960). Dacia, located in the area of Transylvania, was conquered in 107 AD in order to capture the resources of the region for Rome. The amount of gold that came into Roman possession actually brought down the value of gold (Shepard 1993). Iron was also of importance to the region. Taken by military might, the difference between the mines of Noricum and Dacia was the presence of a slave population as a workforce. However, nearly two centuries after the conquest of Dacia, the Romans withdrew and the people, having adapted to the Roman culture, continued in a version of Romanisation (Shepard 1993). The earliest metal manipulation was probably hammering (Craddock 1995, 1999), where copper ore was pounded into thin sheets. Beneficiation, or the process of ’making better’ could be carried out on the ore (if there were large enough pieces of metal separate from mineral) or after melting, where the prills of metal could be hand picked from the cooled slag. Melting beneficiated metal also allowed early metallurgists to use moulds and casts to form shapes of molten metal (Craddock 1995). Many of the metallurgical skills developed in the Bronze Age were still in use during the Roman times. Melting—the process of using heat to separate slag and metal, Smelting—using a reduced oxygen heated environment to separate metal oxides into metal and carbon dioxide, Roasting—process of using an oxygen rich environment to isolate sulphur oxide from metal oxide which can then be smelted, Casting—pouring liquid metal into a mould to make an object, Hammering—using blunt force to make a thin sheet which can be annealed or shaped, and Cupellation—separating metal alloys to isolate a specific metal—were all techniques which were well understood (Zwicker 1985, Tylecote 1962, Craddock 1995). However, the Romans provided few new technological advances other than the use of iron and the cupellation and granulation in the separation of gold alloys (Tylecote 1962). While native gold is common, the ore will sometimes contain small amounts of silver and copper. The Romans utilised a sophisticated system to separate these precious metals. The use of cupellation, a process developed before the rise of Rome, would extract copper from gold and silver, or an alloy called electrum. In order to separate the gold and silver, however, the Romans would granulate the alloy by pouring the liquid, molten metal into cold water, and then smelt the granules with salt, separating the gold from the chemically altered silver chloride (Tylecote 1962). They used a similar method to extract silver from lead. While Roman production became standardised in many ways, the evidence for distinct unity of furnace types is not strong, alluding to a tendency of the peripheries continuing with their own past furnace technologies. In order to complete some of the more complex metallurgical techniques, there is a bare minimum of necessary components for Roman metallurgy: metallic ore, furnace of unspecified type with a form of oxygen source (assumed by Tylecote to be bellows) and a method of restricting said oxygen (a lid or cover), a source of fuel (charcoal from wood or occasionally peat), moulds and/or hammers and anvils for shaping, the use of crucibles for isolating metals (Zwicker 1985), and likewise cupellation hearths (Tylecote 1962). There is direct evidence that they mechanised at least part of the extraction processes. They used water power from water wheels for grinding grains and sawing timber or stone, for example. A set of sixteen such overshot wheels is still visible at Barbegal near Arles dating from the 1st century AD or possibly earlier, the water being supplied by the main aqueduct to Arles. It is likely that the mills supplied flour for Arles and other towns locally. Multiple grain mills also existed on the Janiculum hill in Rome. Ausonius attests the use of a water mill for sawing stone in his poem Mosella from the 4th century AD. They could easily have adapted the technology to crush ore using tilt hammers, and just such is mentioned by Pliny the Elder in his Naturalis Historia dating to about 75 AD, and there is evidence for the method from Dolaucothi in South Wales. The Roman gold mines developed from ca 75 AD. The methods survived into the medieval period, as described and illustrated by Georgius Agricola in his De Re Metallica. They also used reverse overshot water-wheel for draining mines, the parts being prefabricated and numbered for ease of assembly. Multiple set of such wheels have been found in Spain at the Rio Tinto copper mines and a fragment of a wheel at Dolaucothi. An incomplete wheel from Spain is now on public show in the British Museum. The invention and widespread application of hydraulic mining, namely hushing and ground-sluicing, aided by the ability of the Romans to plan and execute mining operations on a large scale, allowed various base and precious metals to be extracted on a proto-industrial scale only rarely matched until the Industrial Revolution. The most common fuel by far for smelting and forging operations, as well as heating purposes, was wood and particularly charcoal, which is nearly twice as efficient. In addition, coal was mined in some regions to a fairly large extent: Almost all major coalfields in Roman Britain were exploited by the late 2nd century AD, and a lively trade along the English North Sea coast developed, which extended to the continental Rhineland, where bituminous coal was already used for the smelting of iron ore.
15,000 t Largest preindustrial producer. 80,000 t Largest preindustrial producer. 11,200 t At its peak around the mid-2nd century AD, Roman stock is estimated at 10,000 t, five to ten times larger than the combined silver mass of medieval Europe and the Caliphate around 800 AD. 11,119 t Production in Asturia, Callaecia, and Lusitania (all Iberian Peninsula) alone. Romans used many methods to create metal objects. Like Samian ware, moulds were created by making a model of the desired shape (whether through wood, wax, or metal), which would then be pressed into a clay mould. In the case of a metal or wax model, once dry, the ceramic could be heated and the wax or metal melted until it could be poured from the mould (this process utilising wax is called the “lost wax“ technique). By pouring metal into the aperture, exact copies of an object could be cast. This process made the creation of a line of objects quite uniform. This is not to suggest that the creativity of individual artisans did not continue; rather, unique handcrafted pieces were normally the work of small, rural metalworkers on the peripheries of Rome using local techniques(Tylecote 1962). There is archaeological evidence throughout the Empire demonstrating the large scale excavations, smelting, and trade routes concerning metals. With the Romans came the concept of mass production; this is arguably the most important aspect of Roman influence in the study of Metallurgy. Three particular objects produced en masse and seen in the archaeological record throughout the Roman Empire are brooches called fibulae, worn by both men and women (Bayley 2004), coins, and ingots (Hughes 1980). These cast objects can allow archaeologists to trace years of communication, trade, and even historic/stylistic changes throughout the centuries of Roman power. When the cost of producing slaves became too high to justify slave labourers for the many mines throughout the empire around the second century, a system of indentured servitude was introduced for convicts. In 369 AD a law was reinstated due to the closure of many deep mines; Hadrian had previously given the control of mines to private employers, so that workers were hired rather than working out of force. Through the institution of this system profits increased (Shepard 1993). In the case of Noricum, there is archaeological evidence of freemen labour in the metal trade and extraction through graffiti on mine walls. In this province, many men were given Roman citizenship for their efforts contributing to the procurement of metal for the empire. Both privately owned and government run mines were in operation simultaneously (Shepard 1993). From the formation of the Roman Empire, Rome was an almost completely closed economy, not reliant on imports although exotic goods from India and China were highly prized. They included gems, silk and spices. The resources needed to sustain the Roman Empire were internally found; however, the empire still supported trade with foreign non-Roman cultures (Shepard 1993). Through the recovery of Roman coins and ingots throughout the ancient world (Hughes 1980), metallurgy has supplied the archaeologist with material culture through which to see the expanse of the Roman world. ^ Hong, Candelone, Patterson, Boutron 1994, p. 1841–1843; Settle, Patterson 1980, pp. 1170f. ; Callataÿ 2005, pp. 361–365 follows the aforementioned authors, but cautions that the Greco-Roman levels may have already been surpassed by the end of the Middle Ages (p. 365). ^ Patterson 1972, p. 216, table 2; Callataÿ 2005, pp. 365f. Aitchison, Leslie. 1960. A History of Metals. London: Macdonald & Evans Ltd.
Bayley, Justine; Butcher, Sarnia. 2004. Roman Brooches in Britain: A Technological and Typological Study based on the Richborough Collection. London: The Society of Antiquaries of London. Craddock, Paul T. 1995. Early Metal Mining and Production. Edinburgh: Edinburgh University Press. Hughes, M. J. 1980 The Analysis of Roman Tin and Pewter Ingots in Ody, W. A. (ed) Aspects of Early Metallurgy. Occasional Paper No 17. British Museum Occasional Papers. Shepard, Robert. 1993. Ancient Mining. London: Elsevier Applied Science. Sim, David. 1998. Beyond the Bloom: Bloom Refining and Iron Artifact Production in the Roman World. Ridge, Isabel (ed). BAR International Series 725. Oxford: Archaeopress. Tylecote, R.F. 1962. Metallurgy in Archaeology: A Prehistory of Metallurgy in the British Isles. London: Edward Arnold (Publishers) Ltd.
Zwicker, U., Greiner, H., Hofmann, K-H., Reithinger, M. 1985. Smelting, Refining and Alloying of Copper and Copper Alloys in Crucible Furnaces During Prehistoric up to Roman Times in Craddock, P.T., Hughes, M.J. (eds) Furnaces and Smelting Technology in Antiquity. Occasional Paper No 48. London: British Museum Occasional Papers. J. S., Hodgkinson. 2008. "The Wealden Iron Industry." (The History Press, Stroud). Cleere, Henry. 1981. The Iron Industry of Roman Britain. Wealden Iron Research Group. Cleere, H. & Crossley, D. (1995): The Iron industry of the Weald. 2nd edition, Merton Priory Press, Cardiff, ISBN 1-898937-04-4: republishing the 1st edition (Leicester University Press 1985) with a supplement. Lewis, P. R. and G. D. B. Jones, The Dolaucothi gold mines, I: the surface evidence, The Antiquaries Journal, 49, no. 2 (1969): 244-72. Lewis, P. R. and G. D. B. Jones, Roman gold-mining in north-west Spain, Journal of Roman Studies 60 (1970): 169-85. Lewis, P. R., The Ogofau Roman gold mines at Dolaucothi, The National Trust Year Book 1976-77 (1977). Butcher, Kevin, Matthew Ponting, Jane Evans, Vanessa Pashley, and Christopher Somerfield. The Metallurgy of Roman Silver Coinage: From the Reform of Nero to the Reform of Trajan. Cambridge: Cambridge University Press, 2014. Corretti,Benvenuti. "Beginning of iron metallurgy in Tuscany, with special reference to Etruria mineraria." Mediterranean archaeology 14 (2001): 127–45. Healy, John F. Mining and metallurgy in the Greek and Roman world. London: Thames and Hudson, 1978. Hobbs, Richard. Late Roman Precious Metal Deposits, C. AD 200-700: Changes Over Time and Space. Oxford: Archaeopress, 2006. Montagu, Jennifer. Gold, Silver, and Bronze: Metal Sculpture of the Roman Baroque. Princeton: Princeton University Press, 1996. Papi, Emanuele., and Michel Bonifay. Supplying Rome and the Empire: The Proceedings of an International Seminar Held At Siena-Certosa Di Pontignano On May 2-4, 2004, On Rome, the Provinces, Production and Distribution. Portsmouth, RI: Journal of Roman Archaeology, 2007. Rihll, T. E. Technology and Society In the Ancient Greek and Roman Worlds. Washington, D.C.: American Historical Association, Society for the History of Technology, 2013. Schrüfer-Kolb, Irene. Roman Iron Production In Britain: Technological and Socio-Economic Landscape Development Along the Jurassic Ridge. Oxford: Archaeopress, 2004. Young, Suzanne M. M. Metals In Antiquity. Oxford, England: Archaeopress, 1999. This page was last edited on 5 January 2019, at 19:29 (UTC).